SAE Institute Oxford’s portfolio expands; in addition to nurturing the next generation of creative media students, its added Music Business to it’s portfolio, and plans new creative media degree programmes for 2016. Arrive at Littlemore Park, and your first impression is that of a grand stately home. Venture further along the driveway and will you discover a hidden gem that is – SAE Institute Oxford. Some say, this state-of-the-art creative media campus is ‘Oxford’s best kept secret’ nestling in a city famously known around the world for its ‘dreaming spires’ and ‘academic excellence’. SAE Institute Oxford already has an impressive track record. Since it opened in 2008, the campus has gained a reputation for combining creative talent with a strong community spirit sponsoring such events as the High Sheriff’s Challenge and supporting local schools and creative culture organisations. Audio and film students have been able to give technical support to live events such as music festivals, stage productions and community events gaining that all-important hands-on experience. 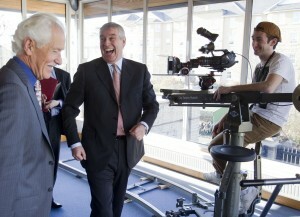 HRH The Duke of York shares a lighthearted moment during his visit to SAE Institute Oxford for the official opening of SAE’s World Headquarters and campus. 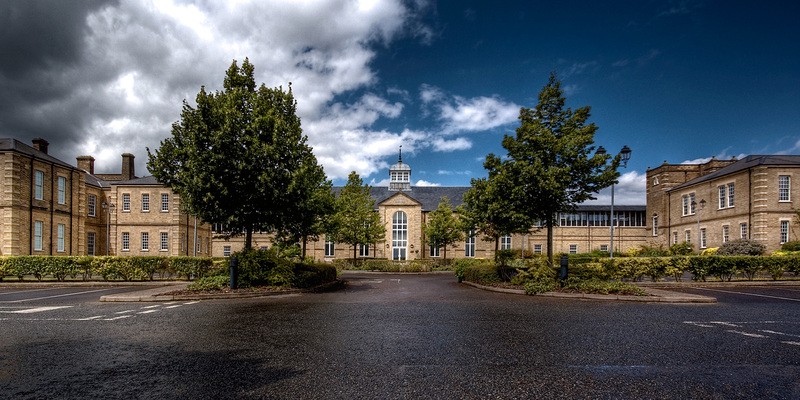 Formally opened by HRH The Duke of York in 2012, the Littlemore Park campus complex is also home to SAE’s World Headquarters and global operation, a network of 54 campuses spanning 27 countries. Although more than half the students are from Britain and Europe, some have travelled from as far as the United States, Mexico, South America, the Middle East, the Far East, Eastern Europe and Australia to study at SAE Oxford. Current students can study a 2-year BA/BSc (Hons) degree programmes in Audio Production, Music Business, Digital Film Making and Interactive Animation. SAE Global at the official opening of SAE’s World Headquarters and Oxford campus. But the good news is, that from September 2016, SAE Oxford is expanding the range of Higher Education degree courses to encompass key elements of the creative media industry by introducing Game Art Animation, Visual Effects Animation, Digital Film Production and Web Development. Colin Ryde, Campus Manager and a regular broadcaster on Radio Cherwell, Oxford’s award winning hospital radio station said, “It’s exciting times for SAE Oxford with the expansion of our degree offerings particularly with animation and web development”. 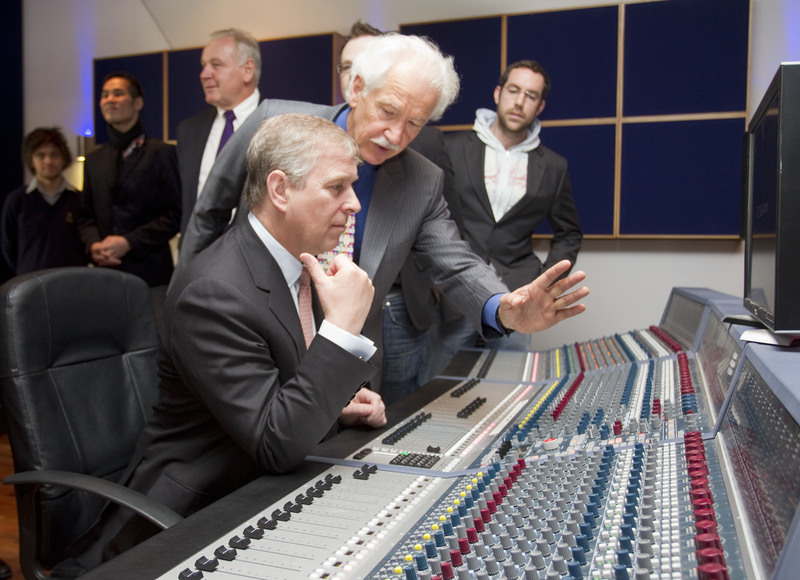 “It’s also extremely encouraging to see the interest being show in our Music Business programme that clearly appeals to a broader range of individuals wishing to develop their careers in the music industry at degree level. Not surprisingly, like all SAE campuses around the world, Oxford has strong connections with the creative media industries through inspirational training from lecturers who are respected industry professionals themselves. SAE Institute film students are able to benefit from the partnership with The Tiffen Company a leading manufacturer of award-winning imaging accessories that includes the Steadicam camera stabilization gear. A specialised Steadicam Authorised Education Curriculum has been integrated into the Digital Film Making course offering, providing students a structured lesson plan in the techniques of Steadicam operation coupled with hands-on experience using the award-winning camera stabilization gear. Wander through the spacious corridors and creative spaces of this impressive campus and you’re likely to come across professional Steadicam operators from the world of movies, television shows, documentaries, news and reality programmes taking part in the Steadicam gold, silver or bronze workshops. Space is all-important when it comes to filmmaking and SAE Oxford certainly has an abundance of that. The Green Screen studio covers approximately 3000 square feet with ample room to build film sets and is equipped with film editing facilities. The film department also boasts and impressive inventory of industry standard equipment including the Red One digital cinema camera, a favourite with Hollywood cinematographer’s and producers. A 20 (foot) professional camera crane and camera dolly with track designed for smooth camera movements sit alongside a range of broadcast cameras and lighting equipment and of course the – Steadicam Scout rig for students to train on and become certified operators. The Lord Mayor of Oxford, Councillor Mohammed Niaz Abbasi formally switches on Energy Groove Radio with Freddy El Turk, Founder and Managing Director of Energy Groove. 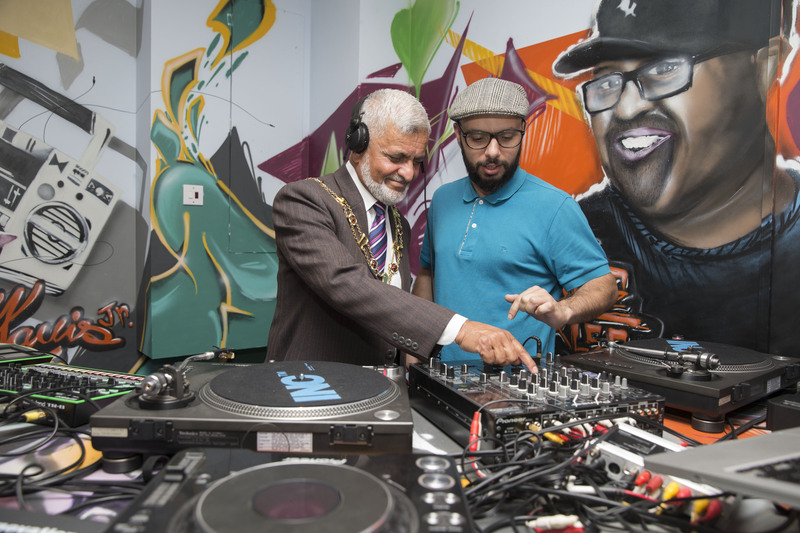 For those budding DJ’s and audio students who are ambitious for a career in radio there is the opportunity to gain first hand experience and knowledge from Energy Groove Radio, broadcast from the heart of SAE Institute Oxford campus. Energy Groove’s partnership with SAE Institute has allowed talented up-and-coming students currently studying with SAE to have a ‘voice’ on radio and develop their audio skills by becoming directly involved in the day-to-day running of a live broadcast radio station. 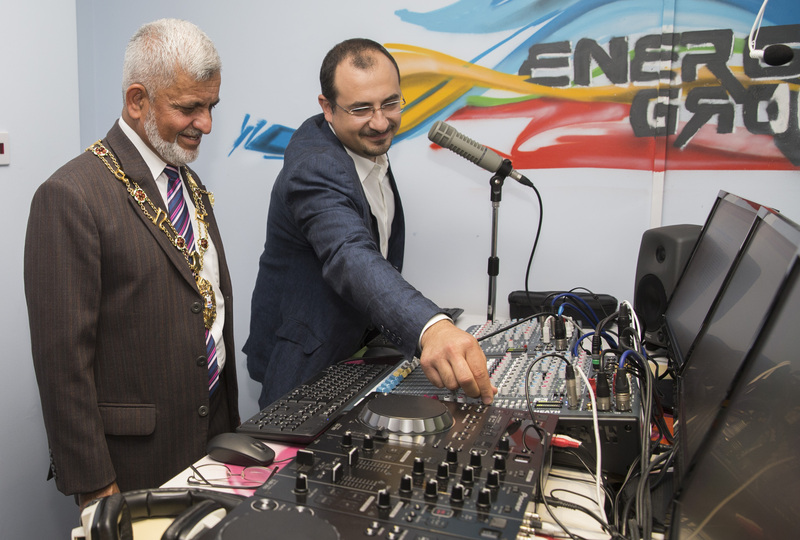 The Lord Mayor of Oxford, Councillor Mohammed Niaz Abbasi pictured during the official launch of Energy Groove Radio at SAE Institute Oxford chats with audio staff member Nick Elia. Studying at SAE Oxford can certainly work up an appetite – with this mind the campus café aptly named Live and Let Dine allows students to enjoy breakfast or lunch, play pool or even giant Jenga while listening to Energy Groove Radio broadcasting live in the background from it’s campus studio. Studio 1: Neve Genesys mixing console along with a selection of outboard including an original vintage Lexicon 480L reverb system. Complimented by a large live space consisting of three separate recording rooms. Studio 2: TLA VTC valve mixing console with outboard from AMS Neve, SPL and more. 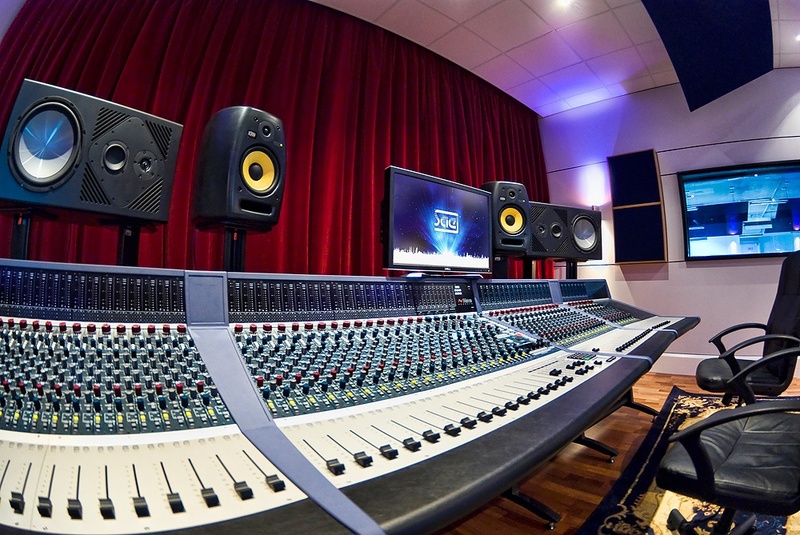 Studio 3: Solid State Logic AWS900 mixing console by Oxford based SSL. Paired with monitors by PMC and the industry staple Yamaha NS10’s. Studio 4: AVID ICON post-production facility featuring the latest Pro Tools HD system and a surround sound monitoring system by Genelec. Studio 5: Neve 88D digital mixing console – one of the most cutting edge consoles for surround concert mixing and post-production work. To arrange a personal tour of SAE Institute Oxford please click. Pictured is the Neve Genesys console in Studio One control room at SAE Institute, Oxford. I was studying for the Audio Engineering Diploma 2014/2015 at SAE Singapore and left before my last semester, and would like to complete it in an environment that is more creative and innovative. Can you advise whether I can complete my last semester at SAE Oxford.